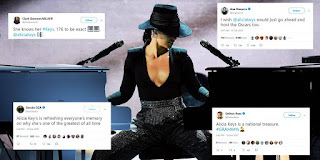 Alicia Keys reminded everyone that she is one of music’s greatest, when she played two pianos at the same time during one of her Grammy performances last night. The If I Ain’t Got You singer, who was also hosting the star-studded event, delivered one of the most impressive performances of the evening, when she played a powerful medley of different songs while sitting between two grand pianos. I've been thinking so much about the people and the music that have inspired me, and I want to give a shout out to Hazel Scott because I always wanted to play to pianos. You know those songs that live inside of you and live inside of me, and you just love it so much, because it was done so well that you wish you wrote it? That's how I feel about these songs. I wish I wrote them. The stunning medley started with Roberta Flack’s 1973 tune ”Killing Me Softly”, merging into Juice World’s "Lucid Dreams" and then Nat King Cole’s classic "Unforgettable". Effortlessly, Keys then switched to Kings of Leon’s 2009 hit "Use Somebody", Drake's absolute tune "In My Feelings", Ella Mai's "Boo'd Up" and finally, finishing with Lauryn Hill's classic feel-good song "Doo-Wop (That Thing)". The 38-year-old's medley turned heads, becoming an instant hit on Twitter.